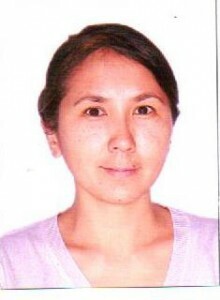 Alken Saltanat Hamzakyzy was born in Karaganda region on the 14th of August, 1983. Education:2003-2006, Faculty of Foreign Languages, Karaganda State University named after E.A. Buketov, specialty – “Foreign Language: two foreign languages”. The author of scientific publications, certificate of intellectual property of MJ KR, 3 manuals, 1 electronic manual, slide-lectures, multimedia presentation. 1. The method of control and evaluation of the students’ achievements on the discipline «The foreign language» in non-linguistic higher educational establishments//«Наукаиобразованиев XXI веке» the materials of international scientific-practical conference, Tambov, part 12; 2013.-P. 8-9. 2. Шет тілі сабақтарында ойын технологияның әдістерін қолдану мүмкіндіктері //«Новое слово в науке: стратегия устойчивого развития экономики регионов» thematerialsofinternationalscientific-practicalconference, 2014. Shymkent: — Mirasunversity. – P.63-69. 3. Шет тілі сабақтарында ойын технологияны қолдану мүмкіндіктері //«Наука и образование в современном мире» thematerialsofinternationalscientific-practicalconference, February 21-22, 2014, Karaganda: «Болашак» university, tom 9.-P.76-78. 4. Mobile technology in foreign language learning // «Наукаиобразованиев XXI веке» the materials of international scientific-practical conference, Tambov, 2014.-P. 8-12. 5. Analysis of the educational system for the study of technical profile language by Kazakh students //European Journal of Natural History, № 3, 2014.-P. 3-9. Impact factor 0,332. 6. Formation of core competencies in learning of students // «Excellence in English teaching and research for better learning outcomes» the materials of international scientific-practical conference, Shymkent, April 28-29 , 2015 — P. 56-64. 8. Automatics and Robotics. The certificate of intellectual property of MJ KR №256, the 2nd of December, 2016. 9. Realization of principles of multilingual education in extra-curricular activities at Foreign Languages Department of KSMU // «Проблемы, опытиперспективыподготовкиполиязычныхспециалистов» the seminar materials , Karaganda, KSMU, the 11th of May, 2017. 10. Workbook on the Professional-oriented English language for the students of the specialty «Technology of pharmaceutical production» // The manual on the Professional-oriented English language, Karaganda: KSMU publishing, 2017.-80 p.